With this new sale of premium Etihad Airways you may consider another attractive deal to visit Thailand, classic exotic destination in South East Asia. You can now also fly from main airports in Germany. (cheapest from Munich but some good fares are available from Frankfurt or Dusseldorf). Round trip flights to Bangkok are now available already for €403. This is for a return ticket including all taxes as well as checked luggage. In addition you may consider to book open jaw tickets as per our below booking sample and travel Thailand from Bangkok down to Phuket..Alsoadding solution to tropical isle of Ko Samui.. This currently running Etihad Airways promotional is valid for flights returning from Thailand in May and June or September and first half of November 2019. Max stay 1 month. Discount is valid for bookings made till 11th of April or until sold out. Please refer to below booking samples of cheap return flights from Germany to Thailand if interested in this deal..
Travel dates. : Check directly with the carrier here as they offer week´s view. Further details of this latest Etihad Airways promotional sale here. In case of booking with the airlines you can use this Etihad discount code. Various hotel booking sites are offering vouchers to further discount your accommodation. Consider to use service of bvooking servers such as Booking.com, Hotels.com or Agoda. 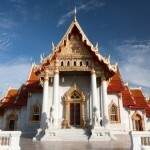 Booking sample of cheap return flights from Germany to Thailand from €403! In this case you would depart from Frankfurt to Bangkok on 27th of May. You return flight from Asia back to Europe would be on 10th of June 2019.